Sweeping nothing under the carpet. 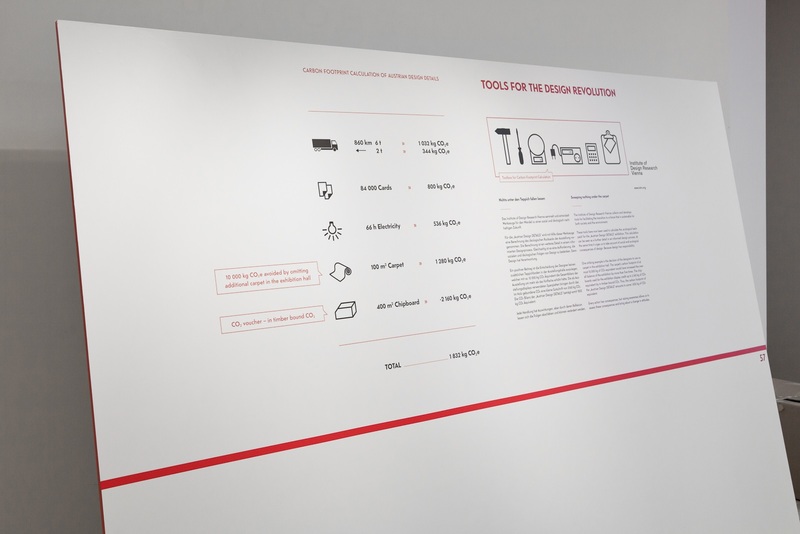 Thanks to the WKO the IDRV got the chance to show an excerpt of “Tools for the Design Revolution” as a small intervention at the “Austrian Design DETAILS 2013” exhibition in Milano. Some of the know-how of the “Tools for the Design Revolution” has now been used to calculate the ‚ecological backpack‘ for the „Austrian Design DETAILS“ exhibition. This calculation can be seen as a further detail in an informed design process. At the same time it urges us to take account of social and ecological consequences of design. Because design has responsibility. One striking example is the decision of the designers to use no carpet in the exhibition hall. The carpet‘s carbon footprint of almost 10,000 kg of CO? equivalent would have increased the overall balance of the exhibition by more than five times. The chipboards used for the exhibition display credit up to 2,160 kg of CO? equivalent by in timber bound CO?. Thus, the carbon footprint of the „Austrian Design DETAILS“ amounts to some 1,832 kg of CO? equivalent. Every action has consequences, but raising awareness allows us to assess these consequences and bring about a change in attitudes.